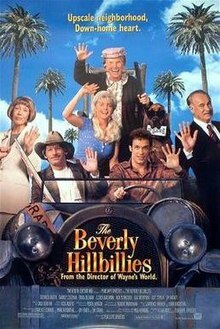 The Beverly Hillbillies is a 1993 American comedy film starring Jim Varney, Diedrich Bader, Erika Eleniak, Cloris Leachman, Lily Tomlin, Dabney Coleman, Lea Thompson, Rob Schneider and Penny Fuller. It is based on the 1962–1971 TV series of the same name and features cameo appearances by Buddy Ebsen (the original Jed Clampett, in his final motion picture appearance, playing his other classic character, Detective Barnaby Jones), Dolly Parton, and Zsa Zsa Gabor. The film was directed by Penelope Spheeris. The film follows a poor hillbilly named Jed Clampett (Jim Varney), who becomes a billionaire when he accidentally discovers crude oil after missing his target while hunting. Jed Clampett (Jim Varney), a hillsman of humble station, accidentally discovers oil on his land while shooting at a rabbit. Ozark Mountain Oil, interested in purchasing his land, offers him $1 billion for the property. Unsure of what to do, Jed consults his cousin, Pearl Bodine (Linda Carlson), during a family dinner. Pearl suggests a change of scenery for Jed's daughter, Elly May (Erika Eleniak), would be a good thing. Having made up his mind and accepted the money, Jed, his daughter, his mother-in-law Granny (Cloris Leachman), and his nephew, Jethro (Diedrich Bader), Pearl's son, load up Jethro's old, dilapidated truck with their possessions and move to Beverly Hills, California. Milburn Drysdale (Dabney Coleman), the CEO of the Commerce Bank of Beverly Hills (where Jed's money is stored), sends out his secretary/assistant, Miss Jane Hathaway (Lily Tomlin) to meet the Clampetts at their new estate. Miss Jane calls the Beverly Hills Police after the Clampetts arrive, mistaking them for burglars. Upon learning of Miss Jane's mistake at the police station, Mr. Drysdale briefly fires her. But seeing that Jed insists that he still wants her to watch over his affairs, Mr. Drysdale rehires her. The Clampetts settle into their new surroundings. Mr. Drysdale pushes his reluctant son, Morgan Drysdale (Kevin Connolly), into befriending Elly May, to whom he eventually develops an attraction. Miss Jane is also smitten by Jethro, who seems ignorant of her affections. Jed requests Miss Jane's assistance in helping him search for someone who will help turn Elly May into a lady. Woodrow Tyler (Rob Schneider), an employee in Drysdale's bank, catches wind of this and contrives a scheme with his con artist girlfriend, Laura Jackson (Lea Thompson), to steal Jed's money by having her marry Jed. She poses as a French etiquette teacher, Laurette Voleur, and asks for work. "Laurette" feigns romantic interest in Jed, which eventually causes him to propose marriage to her. Shortly before the wedding, Granny hears Laura and Woodrow talking about the scam. Granny reveals herself to the pair and threatens to expose their scam to Jed, and the impending wedding will be off. But before she can, they capture her, restrain her, and have her institutionalized at the Los Viejos Nursing Home so she cannot contact Jed. At the wedding, Woodrow prepares to transfer all of Clampett's money in Drysdale's bank to a Swiss account on his laptop computer when the couple says "I do". Miss Jane, realizing Granny is missing, goes to the office of Barnaby Jones (Buddy Ebsen), and, after learning where Granny is, poses as a nurse and breaks her out. Granny and Miss Jane arrive at the wedding and foil Laura and Tyler's plan when Miss Jane grabs a shotgun and blows the laptop to bits. The police arrest Laura and Woodrow while Jed decides that, since the wedding was off, they would have "one hellacious shindig." Lea Thompson as Laura Jackson / "Laurette Voleur"
The Dolly Parton "band" was composed of members of Rhino Bucket (who had a contributing song on the soundtrack of the 1992 Penelope Spheeris hit movie Wayne's World), the Dwight Yoakam Band (Skip Edwards), and Vern Monnett (Randy Meisner, Texas Tornados and Gary Allan). Parton's appearance reunited her with 9 to 5 co-stars Lily Tomlin and Dabney Coleman. In its first weekend, The Beverly Hillbillies grossed $9,525,375 at the box office. The film moved up to number one two weeks later. The total worldwide gross was $57,405,220, making it a moderate box office success. When directors make a wonderful movie, you look forward to their next one with a special anticipation, thinking maybe they've got the secret. If it turns out they don't, you feel almost betrayed. That's how I felt after The Beverly Hillbillies, one of the worst movies of this or any year. ^ Rhodes, Joe (1993-06-13). "Swimmin' Pools, Movie Stars . . . : Yes, they're making a movie from TV's 'Beverly Hillbillies.' My goodness, should they tamper with a national treasure?". The Los Angeles Times. Retrieved 2010-11-08. ^ "Hollywood To Make Movie Of Old 'Beverly Hillbillies'". Orlando Sentinel. Retrieved 2010-10-06. ^ Willman, Chris (1993-10-16). "Movies: Buddy Ebsen has warm words for Jim Varney's rendition of the Clampett patriarch and for Penelope Spheeris' take on the old series". Los Angeles Times. Retrieved 2010-10-06. ^ Fox, David J. (1993-10-19). "Weekend Box Office : 'Demolition Man' Fends Off 'Hillbillies'". The Los Angeles Times. Retrieved 2010-12-30. ^ Fox, David J. (1993-10-26). "Weekend Box Office : 'Beverly Hillbillies' Hits a Gusher". Los Angeles Times. Retrieved 2012-06-02. ^ "The Beverly Hillbillies (1993)". Box Office Mojo. 1993-12-14. Retrieved 2012-01-23. ^ "The Beverly Hillbillies". Rotten Tomatoes. Retrieved 2012-03-28. ^ "The Beverly Hillbillies :: rogerebert.com :: Reviews". Rogerebert.suntimes.com. 1993-10-15. Retrieved 2012-03-28.